Sunday Afternoon: BB-7 as a Low has almost fizzled out...UAC remains intact..
As expected, a rainy Sunday in Mumbai with frequent showers and occasional thunder...Vagaries reading from 08.30 am -2.30 pm : 61 mms. BB-7 !...Thats the Low now of the AP/Odisha coast. The system has an upper air circulation also, upto the 500 level. Seeing the current situation, system would expect a weak low at sea level to track West/North-West and weaken, along the track as the sea level trough comes Southwards. The UAC associated with it remains strong and effective..all along a Southern Path. The pulse from the system, gives rise to another UAC, West of Gujarat by Monday, 1st September. AS-1 ( at sea level) may form by 2nd and travel West, and bring rains to Sindh Coast and South Pakistan from Tuesday 2nd ....will update on Sunday. Only light isolated rain showers likely in Punjab till Monday. The rainfall remains scanty and isolated. No meaningful system or change seen. Saturday 30th: Day starts as cloudy and rains ( Thunder showers) increase from late afternoon into night. By Sunday morning, City would record around 30 mms. Sunday 31st: An overcast and rainy day with intermittent heavy showers. Heavy spells with thunder in ceratin parts may cause some regional flooding . 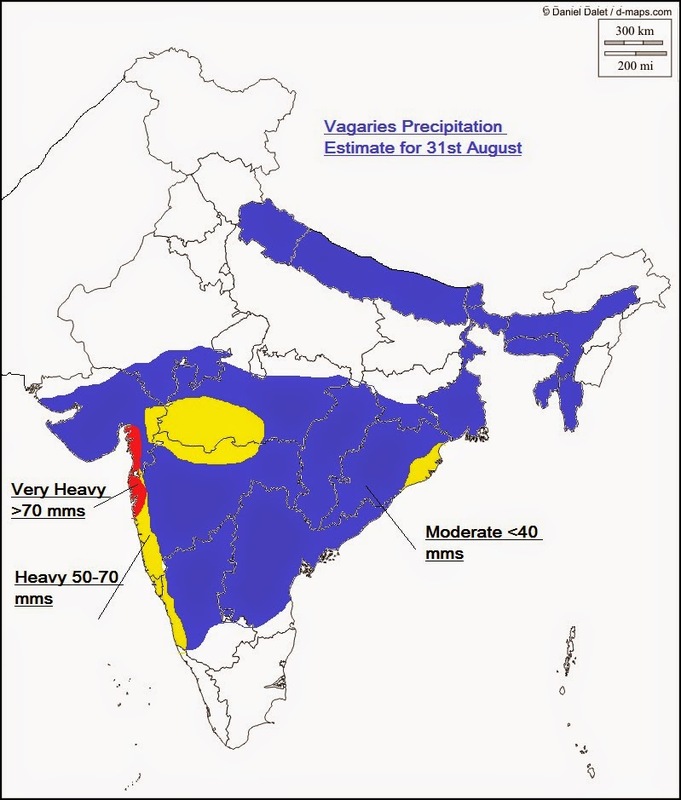 Rains on Sunday may be around 75 mms. Monday 1st Sept: Occasional showers continue, though less than Sunday. Maybe around 25-30 mms. Pune: Saturday and Sunday: Heavy rains and thunder showers from Late Saturday into Sunday. Saturday will measure around 30 mms and Saturday night into Sunday may see around 25-30 mms. Rainfall increasing from Sunday night. Monday and Tuesday sees heavy and intermittent rains and thunder showers. Nagpur : Chance of heavy thunder storm on Saturday evening/night. Hyderabad: Chance of a thunderstorm on Saturday Night and possible showers on Sunday morning. Rain showers and occasional showers continue for the next 3 days in Raipur and Bhubaneshwar. Delhi NCR remains almost dry, except for an odd regional spotty shower on Monday 1st September. Good increase in rains seen from 3rd. Pakistan gets the benefit of the AS-1 system from Tuesday. 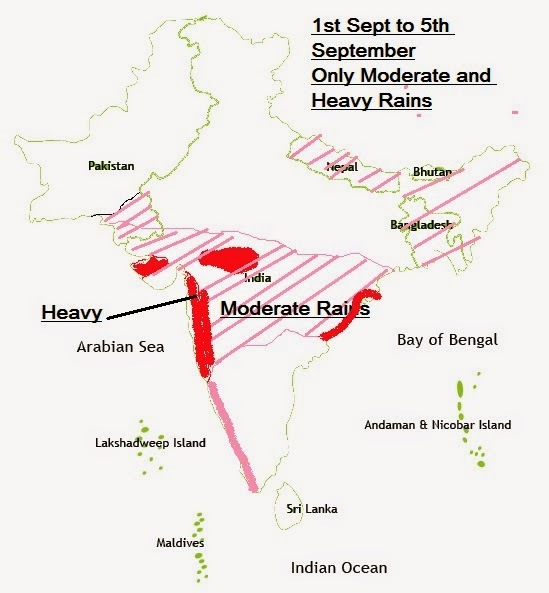 Coastal Sindh, and regions in Southern Sindh may start getting the rains from Tuesday 2nd September. Karachi can get clouds and showers on Tuesday. Dust or thunderstorm possible in Sindh Hyderabad, Mirpur and Nawabshah regions on Tuesday. An isolated localised storm likely in Islamabad and near by vicinity. What about Sindh???? what kind of intensity of rains there would be in 1st week of september? what amount of rainfall would be in sindh in 1st week of september ????? admin????? Always September is a tricky month toss between monsoon withdraw/monsoon not withdraw. 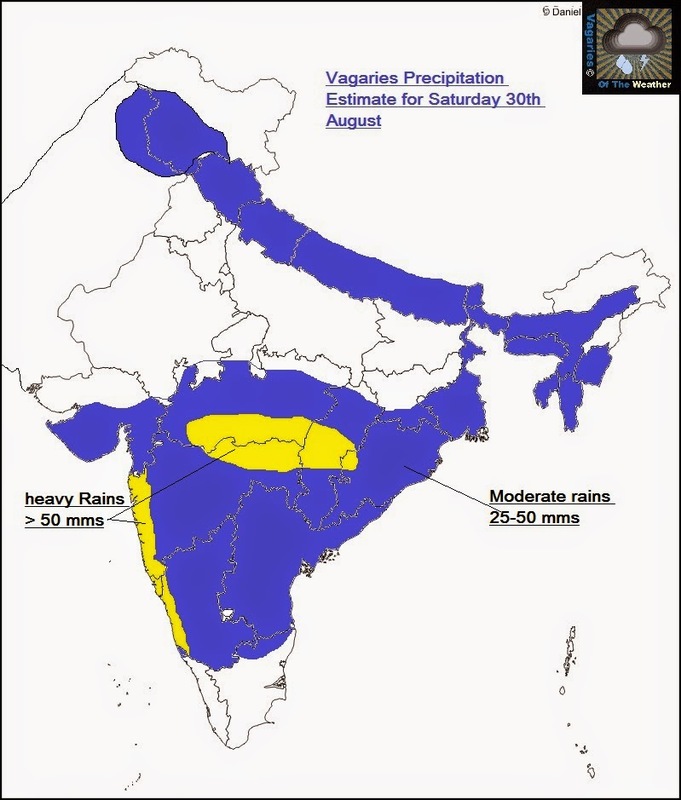 Like 2013 september monsoon u-turn -> IMD forecast - red alert of extreme rains over MAHA/GUJ... today Panjim got a dump of 250mm in 24hrs..
is there any chance of flooding in sindh????? people are saying in private groups in social websites that there is a chance of severe rainfall in sindh in september.... do you think that is there any chance of severe rainfall in sindh in september????? specially in current weather system approaching towards sindh in 1st week of september?????? many of people in private groups are saying that the current weather system in going to a depression and will touch sindh coastal areas but they are saying that that system is going to give heavy rains in most of the sindh in 1st week of september ,,, what is your opinion ?????? is there any threat of heavy/severe rain fall in sindh in 1st week of september ????? admin????? is there any possiblity of heavy or severe rainfall in sindh pakistan in first dacade of september????? Entire southern India has become clear - monsoon is back in NorthWest! and ofcourse we need to keep an eye on naughty GUJ - may become like 2013 torrential rain? Navi Mumbai raining non-stop with heavy spells - Rajesh sir forecast on target. sset what will be the effect of that current system guj in sindh region paksistan???? is the weather system guj going to enter in sindh region ???? Scruz 40mm. With this Santacruz crosses 2000mm mark. SWM total is 2014mm till today. today had a heavy rain in miraroad frm 10am n it poured like cats n dogs in between 10 to 10:30 am.so sir is it the rain going to be so heavy as per your chart frm 1sept to 5th sept.